The basis for the concept of 'starseeds', or 'star people' is that we all have lived in many realities in many planetary systems and in dimensions as other life forms. There are millions of those within our multiverse who have chosen to incarnate at this particular time to help earth and its inhabitants shift into a higher vibrational dimension. These entities seed the planets with information and spiritual frequency when one cycle of time is about to end and another begin. As planetary frequency increases, so too does their levels of awareness, and need to help others, and return to their natural state of being, a soul spark of light. There are many Starseeds or star people on planet Earth today who are encoded with a "wake-up call" designed to "activate" them at a pre-determined moment in life. There are many aspects that trigger awareness. Awakening can be gentle and gradual, or quite dramatic and abrupt, some are awakened by seeing 11:11 on digital clocks. 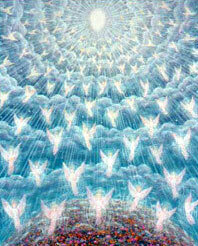 In either event, memory is restored to varying degrees, allowing starseeds to consciously take up their missions. Their connections to the Higher Self are also strengthened, permitting them to be largely guided by their inner knowing. Many have no connection to the mainstream systems of society, this includes political, economic, and religious. Many prefer to work only in the esoteric fields. This allows them to search for their own inner truths, clear issues and understand their work here and now. "As the old programs of a dying world begin to unravel, you may experience a little discomfort, such as your entire world falling apart. It may be useful during this transition to remember that you are an interdimensional master who is an expert at transmuting crumbling realities. You have done this many times before."